Found a great article about choosing a Legion. This is one of the best articles I’ve come across in regard to the DA/SA or SAO debate. So Sig is conducting a mandatory replacement of the carriage assembly in SIG MCX rifles. SIG has found through extensive factory testing that in extremely rare instances, not reported in the field and extremely difficult to replicate, a condition may exist causing an unintended discharge. Sig advises to stop using the MCX immediately, register your firearm on their website if you haven’t already done so, then initiate the process and view a video explaining how to change out your carriage assembly. I tried calling Sig this afternoon and wasn’t able to get through to a representative after being on hold for 20 minutes. SIG will send you a prepaid box to return your complete carriage assembly to the factory. A new assembly, designed with the firing pin locking mechanism, will be shipped out to you within 5-7 working days of the receipt of your parts at no cost to you. Sig is also providing a $50 gift voucher for any inconvenience this may have caused. Way to go Sig for immediately taking care of this issue. Though it doesn’t seem like an all out recall Sig seems committed to fixing any issues before an MCX owner could even have one. *Serial numbers 63C000044 – 63C003702 – Contact SIG Customer Service for instructions. *If you have replaced your trigger group with an aftermarket trigger please contact SIG Customer Service for instructions. *SIG SAUER Dealers should call designated Commercial Sales Support Representative. *Any MCX rifle with a serial number ending in 25000 or higher is exempt from this program. For single action firearm enthusiasts Sig created the full size P226 SAO Legion. With many of the same features as the P226 DA/SA version Legion, the SAO includes an enhanced action with Master Shop Flat short reset trigger. The trigger pull comes in at 5.0lbs and measures just a bit longer and a tad bit heavier than the DA/SA version at 8.2″ (208mm) overall and .4oz (9g) heavier. You can still find all the premier features the Legion series of firearms are known for, such as the Legion Gray PVD finish, reduced and contoured elite beavertail, enhanced checkering on front strap and under the frame relieved trigger guard, solid steel guide rod, and custom high checkered G-10 grips with Legion emblem. Shooters will still find X-RAY Day/Night Sights on this Legion as well as a picatinny rail for whatever accessory the shooter prefers. The SAO only comes chambered in 9mm with a 15rd capacity. It still includes three magazines and will come with a special Legion series soft case and challenge coin after the serial number is registered with Sig. 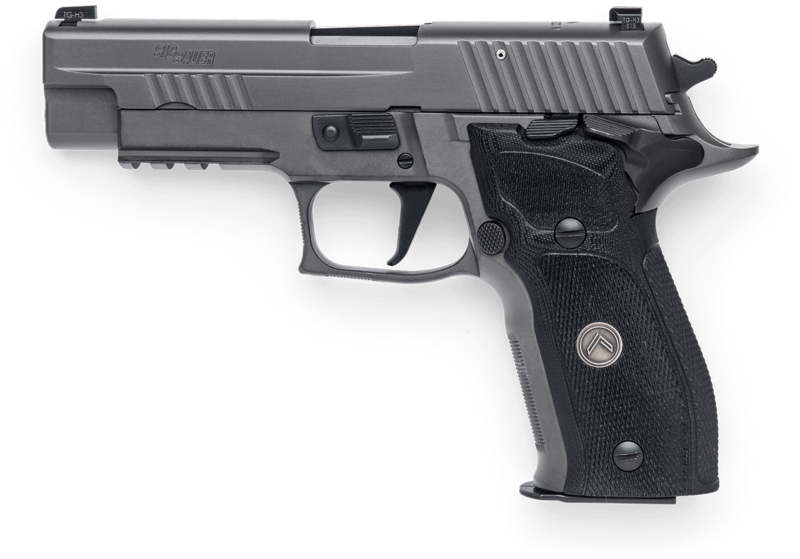 One of two variants of the P226, Sig’s Legion in Dual Action/Single Action (DA/SA) is a full size elite hand gun. With a barrel length of 4.4″(112mm) it measures at an overall length of 7.7″(196mm) and weighs in at 34oz(964g). The Legion Gray PVD finish coats the alloy frame and stainless steel slide complete with the custom high checkered G-10 grips with signature Legion emblem. This P226 also has a solid steel guide rod. The frame has a reduced and contoured elite beavertail and enhanced checkering on the front strap and relieved under trigger guard. A compliment to holstering is the low profile slide catch and decocking levers. The DA/SA version of this Legion has a 10.0/4.4lb trigger pull via an enhanced action with Grayguns Intermediate Reach Adjustable Short Reset Trigger (SRT). In regard to accessories, the P226 Legion DA/SA includes X-RAY™ Day/Night Sights, three magazines and incorporates a picatinny rail. You can find this variant chambered in 9mm, .357, and .40S&W with capacities of 15 rounds for the 9mm, and 12 for the .357 and .40S&W. MSRP for this premier firearm is $1,428 but can be had for a bit less on various dealer websites. For thousands of years, one symbol has been a rallying cry for the world’s most revered warriors. And for decades, one brand of firearms has served more elite fighting forces than any other. Painstakingly engineered and enhanced for the discerning few with the same warrior spirit that inspired it. We have always given professionals what they need. Now, we are giving them what they want. Click above to visit Sig Sauer’s website for the Legion series of firearms and accessories.